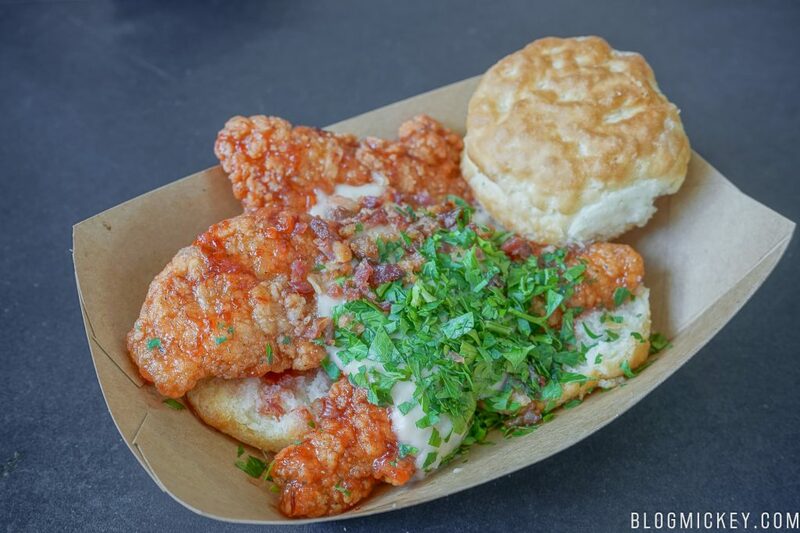 A new year means a new menu for Backlot Express at Disney’s Hollywood Studios. Not only did Disney get rid of the Star Wars naming for their dishes, but they also decided to add some new dishes to the menu. We made it out to Hollywood Studios over the weekend to give everything new a try. First up we have the Cuban Sandwich. It may not look like much at first glance, but what the Cuban Sandwich lacks in presentation, it more than makes up for in taste. 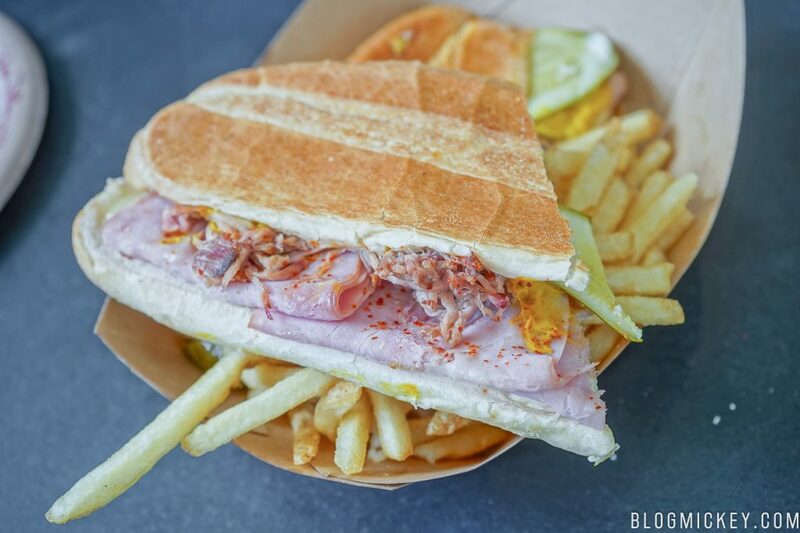 With plenty of mustard and pickles, the Cuban Sandwich delivers on classic taste. The bread was perfectly fresh and pressed to a soft crunch on the outside. The meats were also fresh, making the Cuban Sandwich a very solid addition to the menu. It’s worth noting that while it may not be obvious from the photos, there is another half of the sandwich beneath the fries. 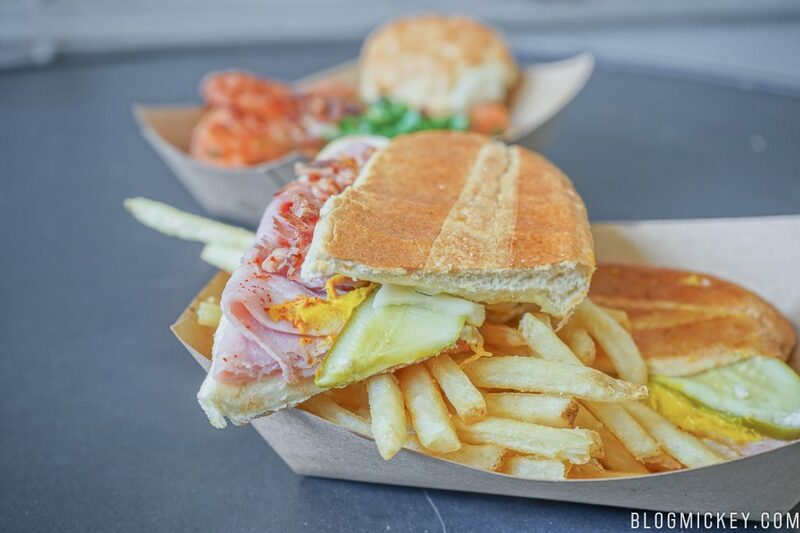 We’re fans of Cuban Sandwiches in general and Backlot Express delivers a really good offering here. We can definitely recommend it for your next visit. 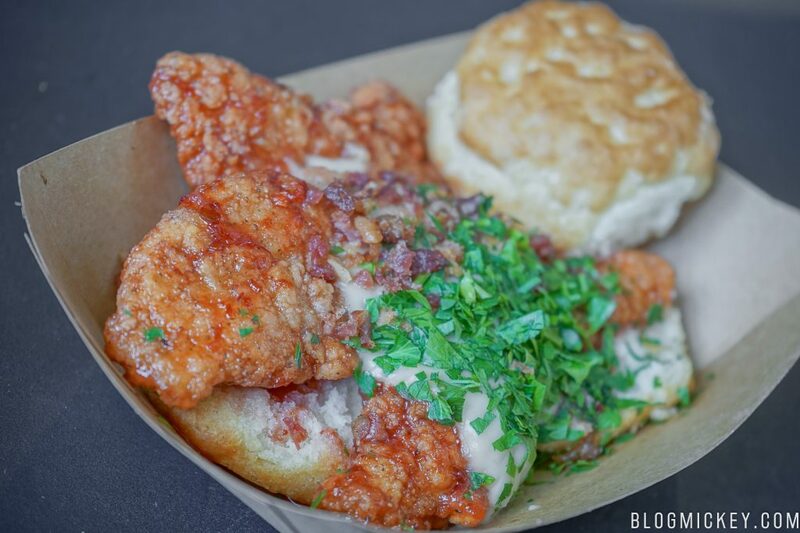 Fans of chicken and biscuits will find a fun twist on an otherwise classic southern dish. The chicken was cooked well, and the crispy exterior wasn’t too tough to get through. A plastic fork and knife did the trick. The biscuits were soft, but kept their shape. We’re used to biscuits that crumble into a lot of pieces when used as a bun, but we found these to be really well made. The winning part of this dish was, without a doubt, the strawberry glaze. We noticed not only a bit of spice from the glaze, but also a strawberry flavor. It’s a bit of a surprising combo for a quick service restaurant at Disney, but it works really well. 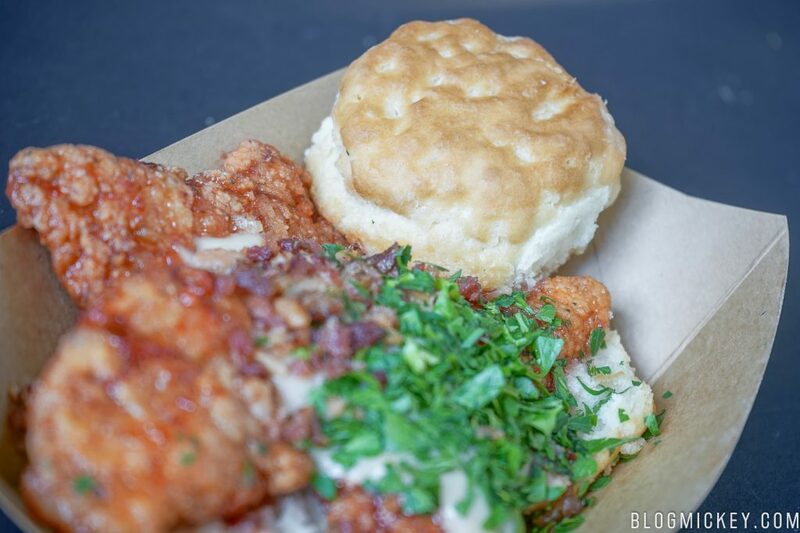 Bacon bits and gravy finish off the dish nicely, earning the Chicken Breast Strip with Biscuits a definite recommendation from us. This was the most interesting dish of the new menu, and not in a good way. 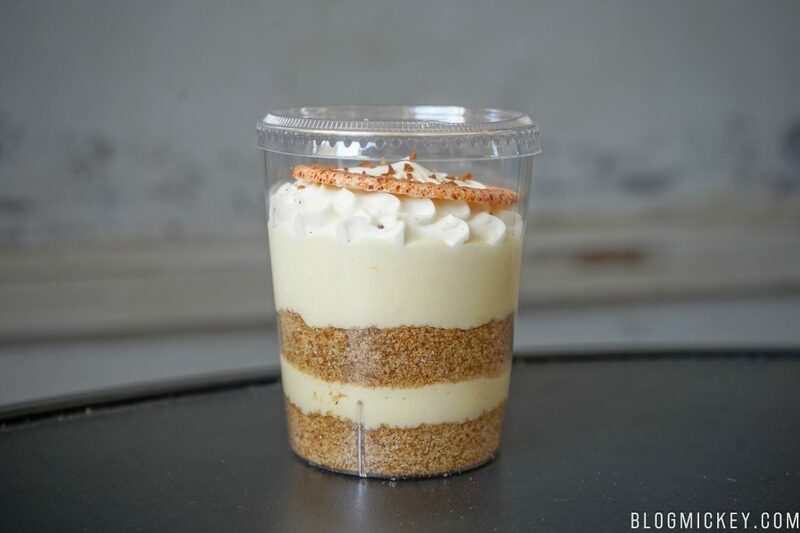 The Key Lime Verrine was essentially a deconstructed Key Lime Pie, with layers of Key Lime custard and graham cracker. The whole dessert was topped off with whipped cream and a white chocolate ring. Where the dessert broke down for us wasn’t the flavoring (it was a traditional key lime flavor), but rather the graham cracker crumble texture. It was much more fine in texture than it should have been, and had bits of sugar in it that just didn’t work well. If you can get past the almost sand-like texture of the crumble, it can be an enjoyable dessert. For us, it earns a pass. 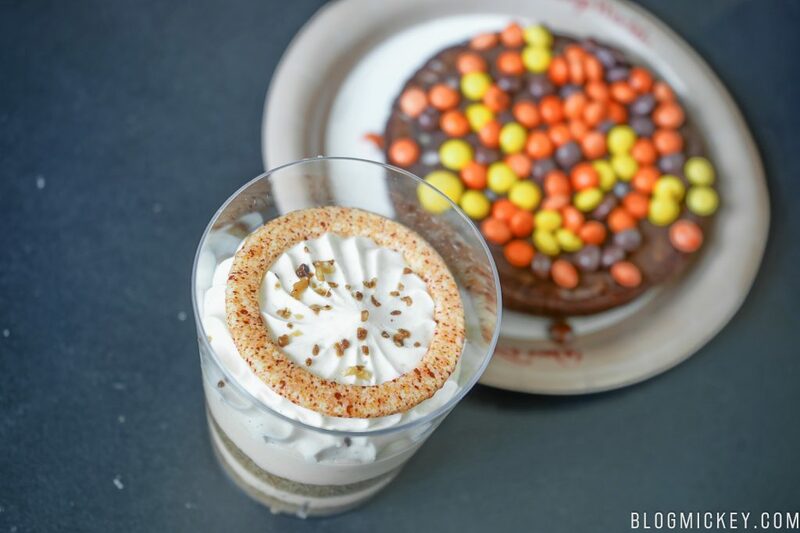 There isn’t a lot to explain here, it’s a thick, rich brownie with Reese’s Pieces sprinkled heavily on top. 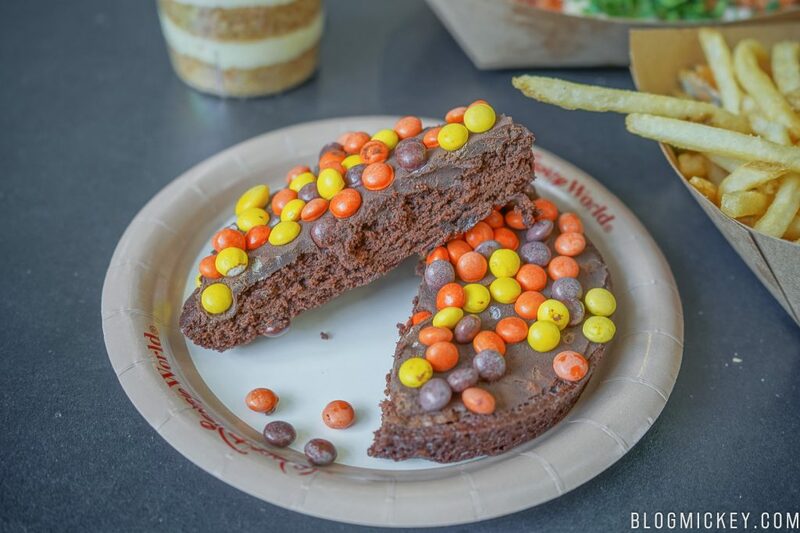 One thing to note is that while the name of the brownie carries the “peanut butter” tag, the only way you’ll get any peanut butter flavor is from the Reese’s Pieces themselves. There is no peanut butter in the actual brownie, as shown in the photo above. It’s a rather large brownie that does just enough well to earn the $4.49 price tag and a recommendation from us. Overall, this is a really strong update to the menu. 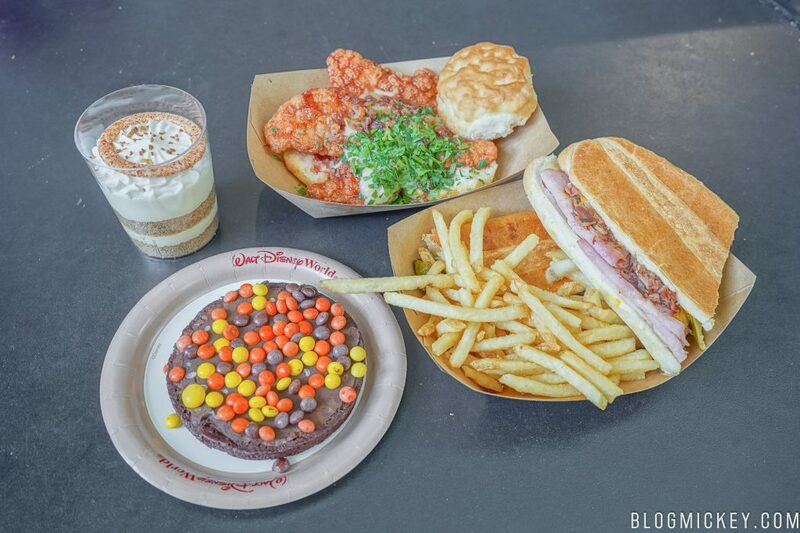 It’s worth noting that other favorites such as the Royal Guard Burger and the Galactic Salad have stayed on the menu, just under new names – the Backlot Burger and the Southwest Salad with Chicken, respectively. 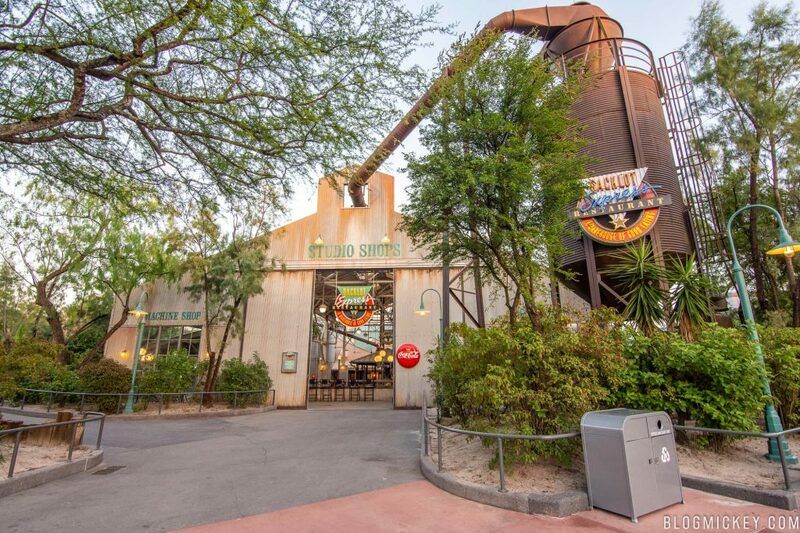 The new items are really quite good and make Backlot Express worth a visit on your next trip. You can’t go wrong with either entree! I was so saddened to hear of the dimissal of the Dark Side Chicken & Waffles, but these new menu items look great! Thanks for sharing, this will defintley help me on my upcoming WDW trip.